Does your pet need a warm place to sleep? LectroKennel heated products are specifically designed to provide your pet with a warm place to rest. 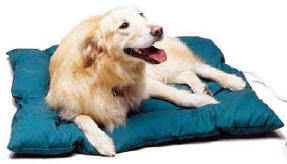 Unlike heating pads designed for human use, these items match your pets body temperature. Ideal for sick, older, or whelping pets. A warm place for your dog. Features washable exterior and steel wrapped cords to prevent chewing. A soft heated bed for your pet. Available in three sizes. Heated pads specially designed to fit the popular 'Igloo' style dog houses. Two layers of thick orthopedic foam. Removeable heater for washing.